iPhone to miss out on mobile gaming boom? Apple iPhone: the perfect showcase for mobile games? 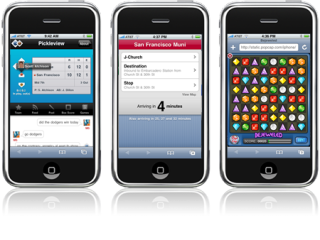 Games developer and Mac fan John Carmack has hit out at Apple over its lack of support for gaming on the iPhone. Carmack - founder of id Software, the company behind the Doom and Quake first person shooters - says he'd love to develop for the iPhone. He says he even had a 'heated' argument with Apple CEO Steve Jobs about it at Apple's Worldwide Developer Conference (WWDC) last summer. "The honest truth right now is that Apple's not exactly hugely supportive of this. When they finally allowed games to be put on the iPod... in many ways it's one of the worst environments to develop games for. You have to work on an emulator... just all these horrible decisions," Carmack told GameDaily. "I expressed my fears directly to Steve Jobs that some of these mistakes might be carried over to the iPhone, so they're at least aware of all of them, but they're not giving any spectacular signs that it's going to be a big deal for them in the next year." It's obviously disappointing - but unsurprising - news for Mac fans who may have been led to expect a renewed focus on gaming by Apple. This looked slightly more likely after Steve Jobs welcomed Electronic Arts on to the stage at WWDC - the event that also saw the first public showing of idTech 5, id Software's new games engine. Until Apple finally enables games to be developed for and downloaded on to the iPhone, wannabe mobile gamers will have to content themselves with web-based games - such as Tetris and Bejeweled - none of which are great for showing off what the iPhone can really do. However Carmack does offer some crumbs of comfort to game-less iPhone owners: he says the reason mobile gaming hasn't taken off it because most mobile games "are just crap". This all adds up to a golden opportunity for Apple who could really establish the iPhone as a mobile gaming platform. It's shame then that this looks like one opportunity that Apple is willing to pass up.